White, baked epoxy finish, satin polish (stainless steel). Contact factory for anodize finish options. 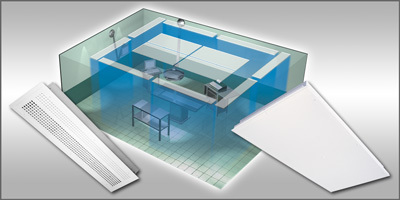 Perimeter air curtain diffuser used in AORTA systems where “room-side replaceable” HEPA or ULPA filters are required. Superior filter design maximizes efficiency and minimizes pressure loss – each Magna-Pak filter is dynamically tested at the factory and labeled with the results. Dual chamber design means stable performance regardless of inlet condition or damper position.